Can You Eat Grapefruit With Norvasc? Can Vitamin C Affect Synthroid? Zoloft, the brand name of sertraline, is a prescription medication used to treat major depression, obsessive compulsive disorder, panic disorder, posttraumatic stress disorder and premenstrual dysphoric disorder. It belongs to the class of antidepressants called selective serotonin reuptake inhibitors. 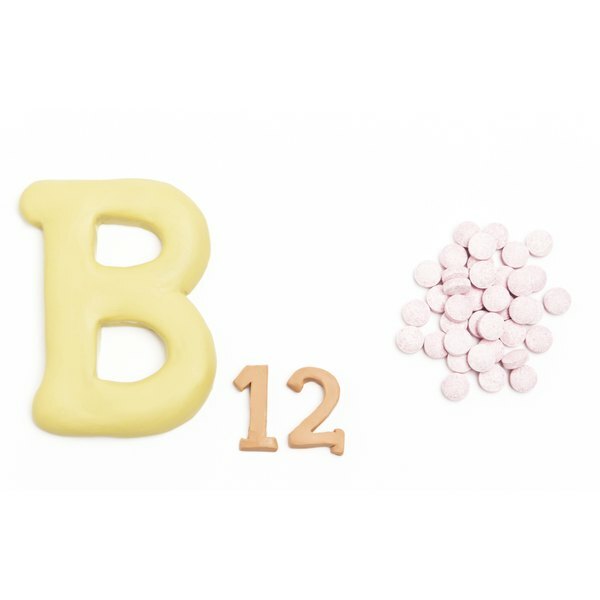 Vitamin B12 is a water soluble vitamin used for vitamin B12 deficiency, megaloblastic anemia due to vitamin B12 deficiency and pernicious anemia. Before using these products together, speak with a health care professional to ensure your safety. Zoloft works by blocking the reabsorption of serotonin, a neurotransmitter found in the brain. This allows serotonin to remain in the brain for a longer period of time and decreases the symptoms of depression. Vitamin B12 plays a role in the breakdown of fat and carbohydrate and the formation of proteins. It also helps the cells replicate and is involved in the production of blood cells. The liver has a high amount of the cytochrome P450 enzymes, which are involved in the breakdown of medications; two of these enzymes, the CYP 2C19 and CYP 2D6, metabolize or break down Zoloft. The medication is removed from the body through the urine and feces. Vitamin B12 is absorbed from the stomach and is stored primarily in the kidneys, liver and adrenal glands. Zoloft may affect the levels of medications that are broken down in the body in same manner. Some examples of these medications include tramadol, phenytoin, valproic acid, lithium, warfarin and sumatriptan. Vitamin B12 may affect certain medications, including phenytoin, phenobarbital, colchicine, methotrexate and metformin. It may also affect the levels of bile acid sequestrants, such as colestipol, cholestyramine and colsevelam, and proton pump inhibitors, such as omeprazole, esomeprazole and lansoprazole. There is no evidence that Zoloft affects the absorption of vitamin B12, or that the levels of Zoloft are affected by the vitamin. Every body is different, and you may react a certain way to a medication; therefore, if you take Zoloft, speak with your physician before using vitamin B12 supplements. Your physician can determine if you are able to take the vitamin and recommend a proper dose. Furthermore, your physician can monitor you accordingly. Be aware of which side effect is normal and which requires medical attention. If you are unsure, always ask a health care professional for advice. Karla Casco began writing in 2010, focusing her work on diseases and treatments and their side effects. She has also created patient handouts, PowerPoint presentations and journal clubs. Karla has a doctorate in pharmacy from St. John's University and holds a pharmacy license for the state of New York. Can You Eat a Grapefruit With Hydrochlorothiazide?